News -In August 2005 Nishat received a Congressional award for his contribution to music and culture from the US Congress -Nishat performed at the Smithsonian Institution in May 2005, featured in the Washington Post (review). -In August 2004, he performed alongside B.B. King, Eric Clapton, Pat Metheny, John McLaughlin, and Carlos Santana at the Crossroads Guitar Festival in Texas. -In March 2004 he was featured in "Discovering Music," a program recorded for the BBC Radio 3 (listen). He also performed for the WDR radio at the Philharmonic Hall in Cologne, Germany. -Nishat performed at the Smithsonian Institution in May 2005, featured in the Washington Post (review). -In August 2004, he performed alongside B.B. King, Eric Clapton, Pat Metheny, John McLaughlin, and Carlos Santana at the Crossroads Guitar Festival in Texas. -In March 2004 he was featured in "Discovering Music," a program recorded for the BBC Radio 3 (listen). He also performed for the WDR radio at the Philharmonic Hall in Cologne, Germany. -Ustad Nishat Khan was recently received in Zagreb by the President of Croatia, where he performed with his Gregorian chant ensemble at the Operahaus Lisinski. 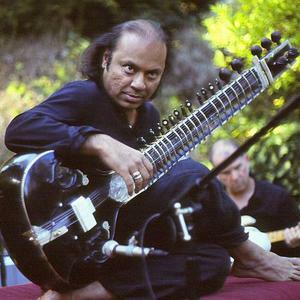 -Ustad Nishat Khan is professor of sitar at the University of California, Los Angeles (UCLA). Nishat Khan with President Stipe Mesic in Zagreb. Nishat Khan transcends musical barriers with his provocative expression and spellbinding technical mastery. Undeniably the foremost virtuoso of the sitar, he is the torchbearer of seven generations and the 400-year old tradition of India 's most renowned musical family. Maestro Khan stands at the threshold of the future of sitar and Indian music with his uniquely invigorating, contemporary approach. The son and disciple of Ustad Imrat Khan, Nishat has been dazzling audiences since the age of seven and his command of the instrument is unparalleled. The explosive passion of his music envelops the mind and the soul in blissful harmony. Maestro Khan's virtuosity has been compared to such luminaries as Jimi Hendrix (Chicago Sun Times) and J.S. Bach (Washington Times) because of the ingenious and deeply personal interpretation of his rich musical heritage. Exemplifying the humanity and universality of music, Maestro Khan has mastered not only the North Indian classical idiom but also realms as diverse as Gregorian chant, Western classical music, abstract jazz, and Flamenco. His sensitive phrasing and remarkable intuition for other musical traditions illustrate the freedom and versatility that has led to collaborations with the world's leading performers and composers such as John McLaughlin, Philip Glass, Paco Pena, Evelyn Glennie, and Django Bates. He has performed at major venues internationally, including Carnegie Hall and the Lincoln Center in New York , and the Royal Albert Hall in London . In January 2004, the President of Croatia received Maestro Khan in Zagreb , where he performed "Meeting of Angels"? with Gregorian chant. Later that year, he was invited to perform alongside Eric Clapton, Carlos Santana, Jeff Beck, John McLaughlin and others at the Crossroads Festival in Dallas , Texas . Most recently, in Summer 2007 he toured across India in a fiery fusion with violinist Vanessa Mae. In 2008 he will tour Europe with his pioneering project, "Spirit & Passion"? featuring Flamenco guitar great Paco Pena, and in the Fall he will perform a solo concert at the Royal Albert Hall in London . In April 2002, Maestro Khan received an award for his inspiration and dedication to humanity from a foundation linked to the United Nations (past recipients included Sting and Nelson Mandela). In August 2002, he was invited to perform at the Japanese Parliament DIET in Tokyo where his concert marked the 50th Anniversary of Indo-Japanese diplomatic relations. He received an award for his dedication and musical excellence from the Pacific Asia Museum in Los Angeles in October 2004. In 2005 he was honored with a U.S. Congressional Award for Contribution to Culture and Community. Nishat Khan is dedicated to preserving and teaching his family's musical tradition; he has taught at UCLA and many other prestigious universities, and he routinely conducts master classes internationally. Future projects will continue to showcase his remarkable foresight as a composer and artist, integrating the brilliant complexity of his North Indian heritage with his refreshing and unprecedented innovations on the sitar.